Premium Compatible Label Tapes for the Brother P-Touch QL500 printer. Compatible Brother DK-11241 Black on White 102mm x 152mm. 5 x 200 Label Rolls. Compatible Brother DK11202 White labels 62mm x 100mm. 10 Rolls; 300 Labels per roll. Compatible Brother DK11208 Black on White 38mm x 90mm Continuous Paper Tape. 5 x 400 labels. Compatible Brother DK11209 Black on White Labels 29mm x 62mm. 5 x Rolls of 800 Labels. 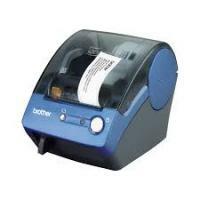 The Brother P-Touch QL500 is a Label Printer that has the capability to work with a variety of label sizes. This printer facilitates easy changing from one size label roll to another. It has a very large footprint than most of the label printers. It uses Brother P-Touch QL500 Label Tapes that have low running costs. The Brother P-Touch QL500 Label Printer has an impressive printing speed as it can print 50 labels in a minute. This machine has a footprint of 5.7 by 7.7 inches which makes it quite large in size than the rest of the label printers. This machine uses a wide variety of labels and that enables their easy installation. But the software used is a little complex and one might take time to learn it. The Brother P-Touch QL500 does not facilitate easy changing of rolls. It has a very fast printing speed and good printing quality. This machine has a maximum resolution of 300 dpi x 300 dpi. It offers a built-in manual paper cutter which allows easy cutting of rolls. The Brother P-Touch QL500 is a Label Printer that is a great choice for users who have personal work. It can also be used for professional work in offices. The Brother P-Touch QL500 Label Tapes have low running costs. This label printer has a very good printing speed and good printing resolution. It can print wide variety of labels and can switch from one format to another easily. But this label printer does not facilitate changing of rolls easily. The printer has a little high cost per label and the software used is a little complex. Q. How can I create a banner label? A. Creating a banner label is easy. Insert the Brother P-Touch QL500 Label Tape. Now, select the tape length. Start P-touch Editor and create a new label layout. Use the tape length spin buttons in the Page Property Box to set the banner length. Add clip art to the banner. Now enter the text and print the label. Peel the printed label from backing and apply the label. Q. How do I reset the PS-9000 to factory default settings? A. There are two methods to reset the factory default settings. Firstly, make sure that the AC adapter is not connected to the product. Connect the AC adapter to the product, while pressing the push button. The orange LED will blink once when the power connection is made. Hold down the push button for two seconds. The orange LED will constantly light and the reset to factory default is completed. Now, release the push button. The second method is using the Brother PS-9000 Utility. Select PS-9000 in the PS-9000 setting dialog box of the Brother PS-9000 Utility and then click ‘initialized’. This way you can reset to factory default settings. Q. The QL500/550 is not printing or a print error is received. What should I do? The USB cable may be loose and not connected correctly. Make sure that the USB cable is connected correctly. Check whether the Brother P-Touch QL500 Label Tape is installed correctly. Try to remove and reload it. Check if there are enough labels left on the tape. Check that the Brother P-Touch QL500 Label Tape compartment cover is close. Q. How can I use the Sequential Numbering function? A. To use sequential numbering function, start up the P-Touch editor. Type the text and highlight the number that you want to increase. Click on ‘Format’ and then ‘Numbering’. The highlighted numbers will be enclosed in a square. Click ‘Print’ to open the print dialogue box. Select ‘P-Touch’ editor from the pull down menu. Click the print button and the labels will be printed with the sequential numbers. Q. How do I remove the Brother P-Touch QL500 Label Tapes? A. To remove the label tapes, firstly press the ON or OFF button. Hold the label tape compartment cover at the sides near the front of the printer and firmly lift up to open the cover. Lift the label lever and hold the label roll to pull the inserted label tape up. Lower the label lever and then close the Brother P-Touch QL500 Label Tape compartment cover. Q. Labels are jammed in the cutter or are not ejected correctly after printing. What should be done? A. There could be two probable reasons to this problem. The edge of the cutter unit might loose its sharpness. Repeated use of the cutter unit will eventually reduce the sharpness of the blade and may cause dull cut. Replace the cutter in this case. The other cause is that there is adhesive buildup attached to the label outlet. Firstly, unplug the power cord from the electrical outlet and wipe away the adhesive buildup on the paper guide surface with a cloth dipped in ethanol or isopropyl alcohol. Q. I need a waterproof label for the Brother QL-500 printer? A. Brother P-Touch QL500 Label Tapes are not affected by water so you should be able to use them to print waterproof labels with your Brother QL-500 printer. Q. How to install the printer driver only? A. To install the printer driver, double click the ‘D_SETUP.EXE’ icon in the root directory of the CD or the downloaded file and then simply follow the directions in the dialog box displayed to install the printer driver.